Mountain gorillas live in the misty mountain forests of the Virunga Massif and the Bwindi Impenetrable Forest in central Africa. They have longer, thicker fur than other gorilla subspecies, allowing them to live in colder temperatures. Adult males can weigh up to 200kg (31st 9lb), and are roughly twice the size of adult females. When they reach maturity (at around 12 or 13 years old), males develop the characteristic silver fur on their back that gives them the name ‘silverback’. Like all gorillas, mountain gorillas are highly sociable and live in family groups led by the dominant silverback. They are largely herbivorous and eat a variety of shoots, fruit and leaves – wild celery is a big favourite. Today, mountain gorillas are threatened not due to a demand for their meat or their infants, but due to a demand for the lush forest in which they live. For the poverty-stricken communities living around the gorilla habitat it is the forest that provides them with many of their basic human needs, and in the war torn areas of DR Congo these needs are exaggerated. Habitat loss takes away the gorillas’ source of food and shelter, and diminished territory to roam in can also affect breeding patterns. Mountain gorillas are also at risk from poachers. While they do not hunt gorillas, they do leave traps on the forest floor and the gorillas can get caught in these. Formerly known as eastern lowland gorillas, Grauer’s gorillas are the largest subspecies of gorilla, and adult males can reach up to 250kg (39st, 5lb), making them the world’s largest primate. They are similar to mountain gorillas but can be distinguished by their shorter fur, narrower faces and rounder nostrils. Grauer’s gorillas, in common with other subspecies of gorilla, are largely herbivorous but have been observed eating ants and other insects. 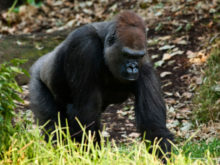 They live in family groups led by the dominant male silverback, and during the day spend their time feeding and resting. Gorillas build new nests to sleep in every night. Poaching, civil unrest, extractive industries (mining, logging, illegal charcoal trade), lack of legal habitat protection. Eastern lowland gorillas are only found in DR Congo, a country plagued by continued conflict. Like mountain gorillas, eastern lowland gorillas are threatened by habitat loss, but the illegal trade in charcoal and mining in DRC, combined with a lack of legal protection for their habitat are putting even greater pressure on the gorillas. In 1996 a small population of gorillas was found living at Mount Tshiaberimu, a small isolated annex in the northern region of the Virunga National Park. The population was facing imminent extinction, threatened by activities such as mining, hunting and the collection of firewood. In rapid decline and ignored by many, The Gorilla Organization pledged to protect this tiny group of gorillas and their habitat. 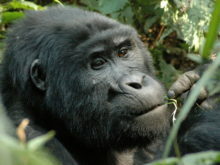 The Mt Tshiaberimu gorillas are morphologically different to the Eastern Lowland gorillas found elsewhere and may yet be reclassified as a distinct subspecies, Gorilla beringei rex-pygmaeorum. They are currently officially classified as Gorilla beringei graueri. Western lowland gorillas are smaller than their eastern cousins – although adult males can still weigh up to 180kg (28st 4lb). They often have much redder or greyer fur, adult males have striking chestnut fur on their head and neck, and the characteristic fur on their back extends further down their thighs giving them a more full-bodied silver look. Western lowland gorillas live in family groups led by a dominant silverback, but unlike eastern gorillas, the group will often split up during the day, coming back together at night to nest. Like all gorillas, they are largely herbivorous, but western gorillas are particularly fond of fruit, which makes up most of their diet when available. They also eat leaves, shoots, bark, ants and other insects. Until recently, conservationists were less concerned about the long-term future of the western lowland gorilla as their vast forest home created a natural boundary between them and their human neighbours. But as the logging industry engulfs the forest, bringing roads, hunters and disease, the western lowland gorillas’ long-term future has been thrown into uncertainty. Unlike their eastern cousins, western gorillas are hunted for bushmeat, and in recent years the spread of the Ebola virus has devastated the gorilla population. The rarest species of great ape in the world, Cross River gorillas are similar in appearance to western lowland gorillas, but have a different shaped skull. They tend to have redder or greyer fur than eastern gorillas. 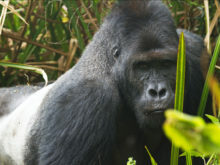 As with all gorillas, Cross River gorillas are sociable and live in groups led by the dominant male (silverback), but their group size tends to be smaller than other subspecies at fewer than six individuals. They are largely herbivorous, eating fruit, shoots and leaves. 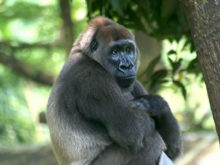 Cross River gorillas were thought to be extinct following the 1960s civil war in Nigeria. However, sightings were recorded during the 1980s, and small numbers of the sub-species were rediscovered in Cameroon and Nigeria on the banks of the Cross River. Because they are so vulnerable to poachers, Cross River gorillas have not been habituated, making study of them even more difficult – they were only filmed in the wild for the first time in 2009. Very little is known about this elusive sub-species of gorilla, except that their numbers are small and their highly fragmented environment could threaten their future. The Gorilla Organization funds African primatologists studying the Cross River gorillas through the Ymke Warren Memorial Conservation Award.